Petzl Hands-free Lighting Duo Head Torches Duo LED 5 E69P. 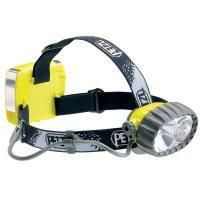 Petzl invented the head light torch in the early 1970s. It's hands-free Lighting at night or in dark spaces whether in hazardous environments that require Atex approved equipment to robust, waterproof head torches has been at the leader in technological innovations since. Hybrid waterproof headtorch: halogen / 5 LEDs. Operates on four AA / LR6 batteries (included) or with the ACCU DUO E65100 2 (optional).